Stuffed “Deviled” Eggs are always a favorite at any gathering. Add some spicy kick to your deviled eggs by trying this Sriracha Sauce recipe variation. Men will devour these up. My son-in-law can attest to that! My youngest daughter likes to get creative by making a variety of deviled egg flavors, including avocado deviled eggs, to serve for the Easter family meal. The origin of deviled eggs can be traced to Rome as far back as 4th and 5th Century A.D. where boiled eggs were seasoned with wine, broth, oil and various spicy sauces and served as a first course for a meal. Even in China, boiled eggs were steeped in tea for flavorings (see recipe for Tea Infused Marble Eggs). The first stuffed egg is credited to Andalusia (now part of Spain) in the 13th century. It became more of a common practice to serve stuffed eggs in Europe by the 16th and 17th Centuries. You will find many different versions and traditions for deviled eggs served among several different European countries. In Sweden for example, deviled eggs are the traditional dish of the Easter Smorgasbord where it’s favored to find sour cream, chopped red onion or caviar mixed with the yolk and garnished with pickled herring, dill or chives on top. 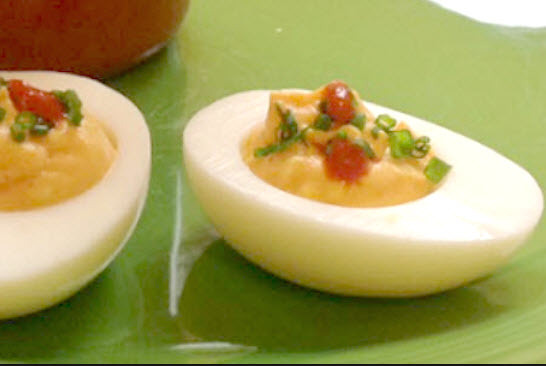 The term “deviled” became associated with stuffed eggs in 18th Century England. “Deviling” food meant to cook or prepare food with spicy hot seasonings or condiments. The classic preparation of deviled eggs stuffed with blended yolk, mayonnaise, mustard and paprika, was first referenced in an 1896 Fannie Farmer cookbook, “Boston Cooking-School Cookbook”. However, it wasn’t until post World War II in the 1940’s, when stuffed deviled eggs became widely popular for most Americans. These days cooks are coming out with many creative and exciting variations to mix with the egg yolk for the stuffing. Check out my informative articles on How To Make Perfect Deviled Eggs and How To Boil and Peel Hard-Cooked Eggs. Place the eggs in a saucepan just large enough to hold them all in one layer. Add water to cover by 1 1/2 inches. Add 1 tablespoon salt. Partially cover the pan and bring to a full rolling boil. Cover, reduce heat to low and leave on heat for 30 seconds. Remove from heat and let stand, covered, for 15 minutes. Pour off hot water and rinse eggs under cold running water for 5 minutes. Pour off the water and shake the pans to crack the eggs. Peel under cold running water. Cut peeled eggs in half lengthwise. Transfer yolks to a bowl. Cover and chill yolks and whites separately for 1 hour. In a large bowl, mash the yolks with a fork. Mash in the mayonnaise and 1 tablespoon Sriracha Sauce. Taste and add more Sriracha Sauce until mixture reaches desired spiciness. Add ground mustard; stir until well blended. Salt to taste. If needed add a little more mayonnaise to add more moisture to mixture. Place the egg yolk mixture in plastic sealable bag. Cut a small corner out of the plastic bag. Squeeze the yolk mixture out of the corner of the bag to fill the egg white halves. This will help the eggs look cleaner. Cover and refrigerate. When ready to serve, garnish the tops of each deviled eggs with minced chives and a drop or two of Sriracha Sauce. Serve well chilled. NOTE: The stuffed eggs may be made 1 day in advance and kept covered and chilled. * To help center the yolks in the eggs, the night before the eggs are to be cooked (approximately 12 hours), store your eggs on their sides in the refrigerator. Seal the egg carton with a piece of tape and turn on its side to center the yolks. ** Sriracha Sauce (a.k.a. "rooster sauce") - This bright red, multi-purpose hot sauce is made from red chili peppers, garlic, vinegar, salt, and sugar. It has only been around since the 1980s. Its flavor is unique, addictive, and wildly versatile.